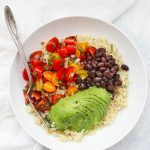 Pico de Gallo Quinoa Bowls – These bright, colorful quinoa bowls are loaded with fresh pico de gallo and ALL the fixins! Perfect for an easy meal or some fresh, healthy meal prep! I had a friend recently ask me how I get ideas for recipes. I didn’t really know what to tell her! I love reading cookbooks and eating at restaurants, which might spark an idea (“hey, I just had some great Jamaican jerk chicken—ooh! I should try Jamaican Jerk chili!”) but most often my recipes stem from cravings. The kind I can’t stop thinking about. The kind I *dream* about. 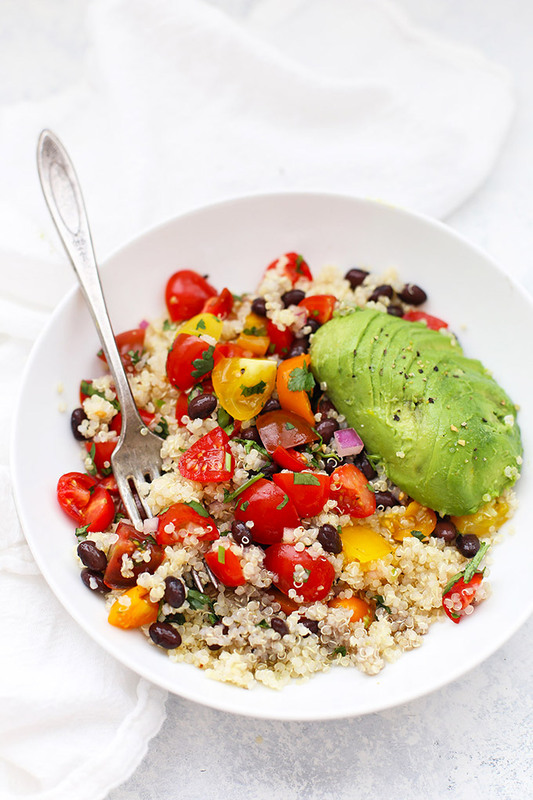 And these pico de gallo quinoa bowls? Totally a craving I couldn’t stop thinking about. I’ve had the BIGGEST craving lately for some good pico de gallo (a fresh salsa with big pieces), but a girl can’t exactly just eat a bowl of pico de gallo on its own for lunch (not that I haven’t tried!). So, pico de gallo quinoa bowls were born. Bright, fresh cilantro lime quinoa paired with lots of fresh pico de gallo and whatever “fixins” sound good. Avocado, black beans, soft-boiled eggs, chicken, greens—you name it! I may or may not have finished this entire recipe all on my own over a few days. I meant to share, but… they were too good. Best of all, there are plenty of tips and tricks to make these easy (and meal prep friendly!) 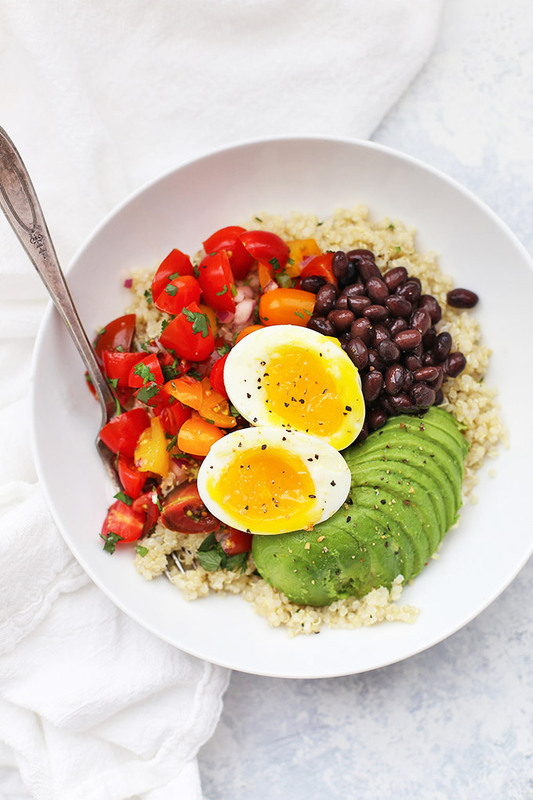 quinoa bowls on your own. For me, it all starts with some quality pico de gallo. This chunky fresh salsa is one of my FAVORITE things in all the land. There are dozens of ways to change it up (try using Roma tomatoes, add a little garlic, kick up the jalapeño, etc. ), but I’ve shared my most common version below. You’ll definitely want to scale the heat to your own preference. I’m kind of a baby, so I only use a little jalapeño for mine, but depending on how spicy your pepper is and how spicy you like your salsa, you may want to add more. Second, it’s alllll about the add-ins. Keep it meatless with a classic combo like the one above–plenty of pico de gallo, some black beans, and avocado. Or, try adding a soft-boiled egg or some chicken if you prefer to add some non-vegetarian options on top. I’ve even tried this with some vegan chili (recipe soon!) instead of black beans and it was beyond amazing. The cilantro lime quinoa ties everything together and the whole thing keeps like a dream, which makes it a no-brainer for a meal prep lunch. Store all the components separately, or mix it all together–whichever makes you happiest! About the pico de gallo – In a rush? 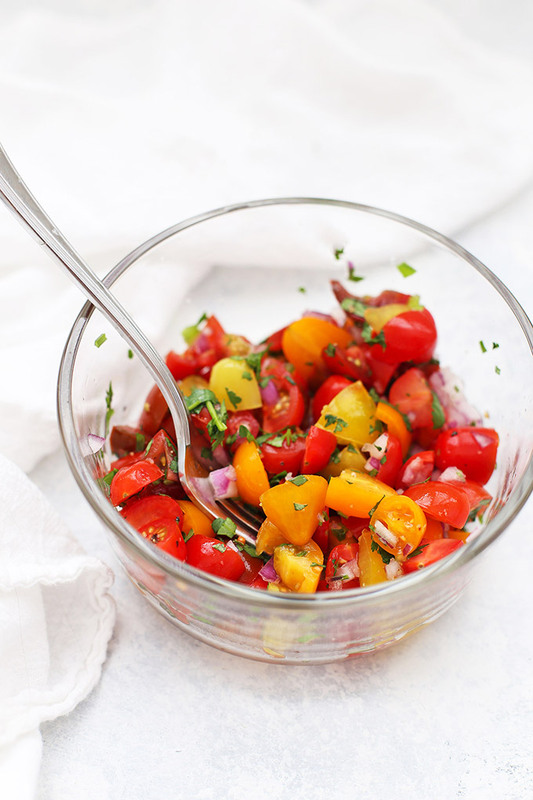 You can totally buy store-bought pico de gallo. Many grocery stores carry freshly made salsas and guacamole, and I usually find pico right in that area next to pre-cut veggies or dips and hummus. Let’s Talk Quinoa – I’ve been asked a few times about quinoa brands. I’ve had good luck with several brands, including Bob’s Red Mill, Ancient Harvest, Lundberg, truRoots, Kirkland Signature (Costco), and more. Amazon carries a ton of great choices to get you started. I often look for organic since they’re often also fair-trade and the price is pretty comparable. Also, feel free to use any quinoa you like here – white, tricolor, or red. They’ll all work! Meal Prepping? Here are my favorite containers – I really, *really* love these little glass meal prep containers. There are 3 compartments (they also come in a 2-compartment configuration), and since they’re glass, they don’t hold onto odors or colors, which is perfect for meal prep when things will be in the containers for a few days. They wash like a dream and they’re just the right size for me. Topping Suggestions – You can make these 100% vegan by sticking with things like corn, black beans, and avocado. If you aren’t vegan, you may enjoy adding chopped grilled chicken or a soft-boiled egg along with yours. Storage Tips – You can serve these all mixed together (like a big salad), or keep the components separate. If I’m serving them with avocado or a soft-boiled egg, I keep those un-cut until serving (or a few hours before). First, cook the quinoa – Heat water in a medium saucepan over medium-high heat until water comes to a boil. Add rinsed quinoa and cover, reducing heat to a simmer. Simmer about 15 minutes, or until all the liquid is absorbed and the quinoa is plump and fluffy. Stir in lime juice, cilantro, salt and pepper. While quinoa is cooking, make your pico de gallo – In a medium bowl, gently stir together tomatoes, red onion, jalapeño, cilantro, salt, pepper, and garlic (if using). 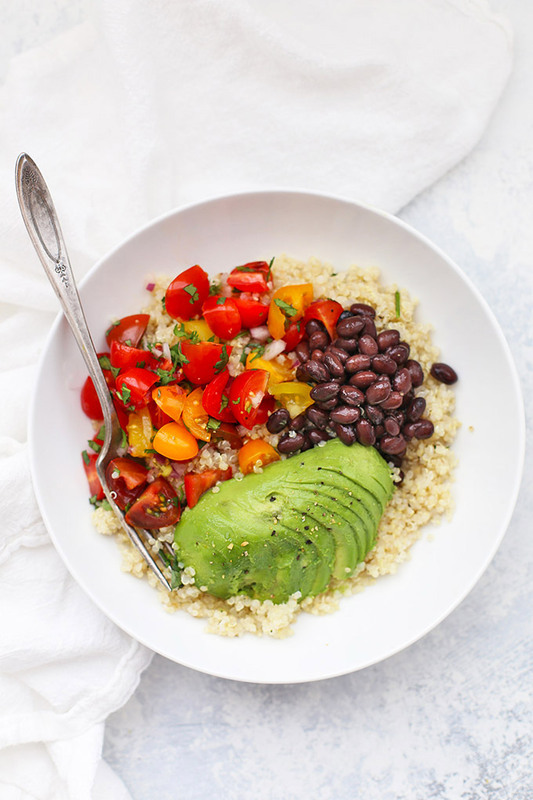 To assemble your bowls, divide quinoa into 4 portions. Serve with about 1/2 cup of the pico de gallo, and about 1/2 cup black beans, and 1/4-1/2 an avocado, diced or sliced. VARIATIONS: You can make these 100% vegan by sticking with things like corn, black beans, and avocado. Or, swap in chili for the black beans and top with some shredded lettuce (like building a taco-style bowl). If you aren’t vegan, you may enjoy adding chopped grilled chicken or a soft-boiled egg along with yours. STORAGE TIPS: You can serve these all mixed together (like a big salad), or keep the components separate. If I’m serving them with avocado or a soft-boiled egg, I keep those un-cut until serving (or a few hours before). Baked pumpkin oatmeal recipe? Where can I find it.